If you are a Motorcycle fan, how do you keep your own safe while you are riding? How do you answer your phone when you are riding? How do you communicate with your partners when you are riding? - SCS ETC Helmet Bluetooth Headset will help you resolve all the above problems!!! Welcome to purchase our products to keep your safe and enjoy your scenery along the way while you are riding!!! CRYSTAL-CLEAR SOUND QUALITY: Featuring new 40mm HD Speakers with Advanced CVC technology to block ambient noise, cuts down on background noise for both incoming and outgoing audio. Music calls intercom conversation can switch seamlessly, ensure safe, comfortable, amazing riding experience. PHONE CALL FUNCTION: SCS ETC S-7 support answer, reject, hand up and redial phone functions. 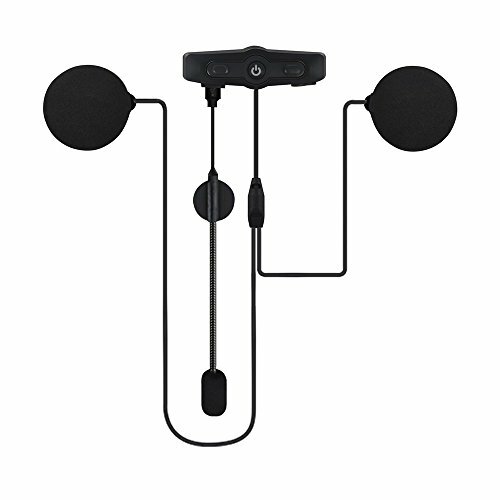 This motor headset will roadcast the calling phone number to let you know who calling. SCS ETC Official Motorcycle Helemt Bluetooth Headset with Camera is available on Amazon, you can search B07F73CLRJ. LISTENING MUSIC FUNCTION: SCS ETC S-7 support playing music via the headphone's Bluetooth technology, you can paly or pause songs base on your decision. MOST HIGH COST-EFFECTIVE PROFESSIONAL HELMET BLUETOOTH HEADSET ON MARKET! With SCS ETC S-7, you can ensure safety and comfort while having hands-free calls, enjoy music, get GPS directions, voice command by bluetooth wirelessly while riding. HELMET INTERCOM FUNCTION: SCS ETC S-7 support communicate with your passenger via 2.5mm Jack K cable within 100 meters / 109 yards (the package included scalable K cable). All SCS ETC Helmet Bluetooth Headset have a 12-month warranty and 100% satisfaction guaranteed. Please do not hesitate to contact us if you have any question or concern, we will fix your issue within 24 hours, Sunday excepted.